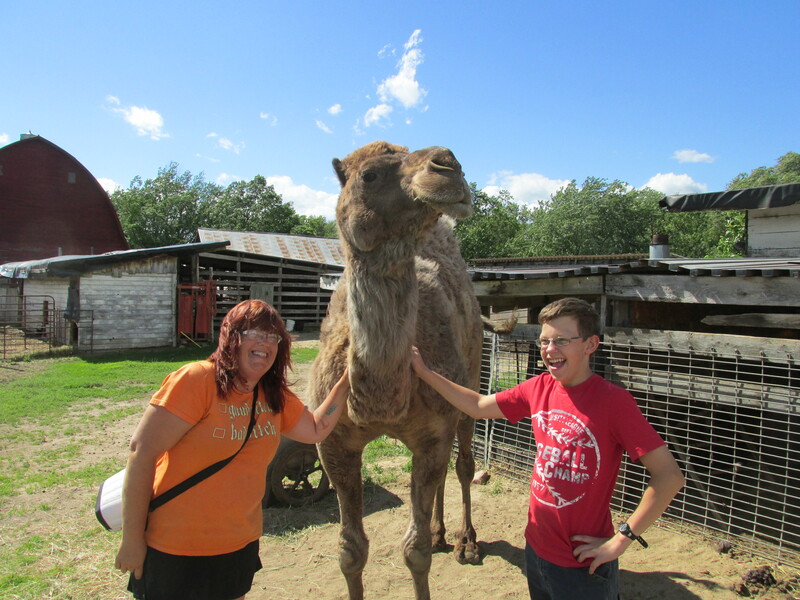 Wherein The Pajari Girls (and Danny) See a Man About a Camel. So, yeah. My sister was introduced to this guy named Wally, who is in the petting zoo business and was downsizing. (Thanks a lot, Sheri Nukala. 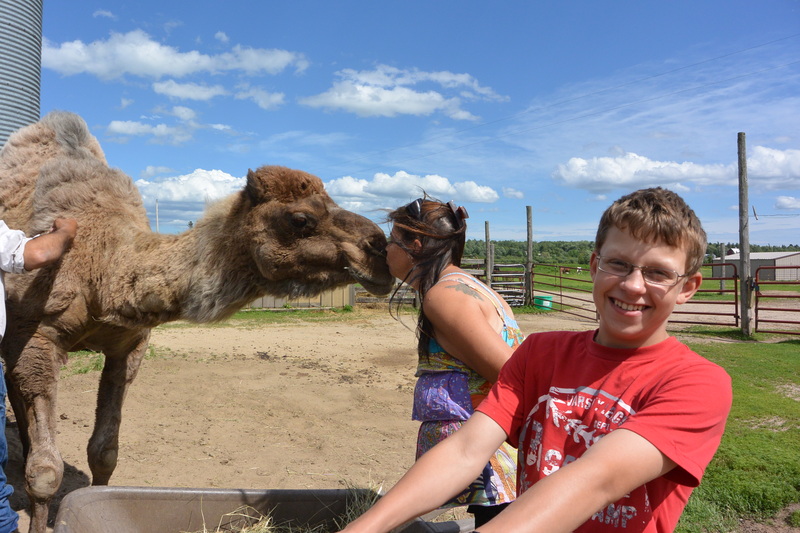 lol) Lois, Jill, Jill’s Spawn, and even Lois’ husband Big Guy have met this Wally character and visited his farm near Bovey, MN. But I was always too busy, too sore, too whatever to go. A couple of weeks ago, Lois needed to go there yet again to pick up some coin-operated feeders for Cook’s Country Connection. Danny was home, and we had no plans, so we decided to ride along. We are both so glad we did! 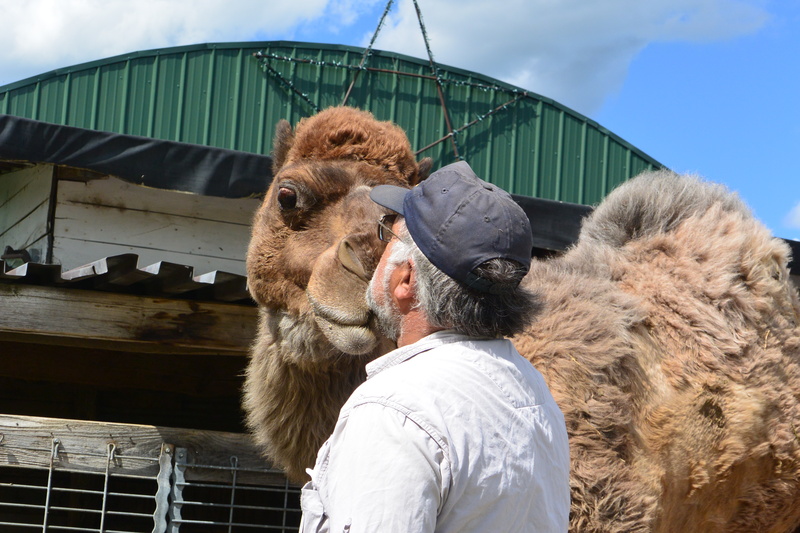 I mean, I knew intellectually that this Wally guy had a camel boarding at his farm, but seeing said camel; touching it, smelling it, standing next to it…that just boggled my mind. 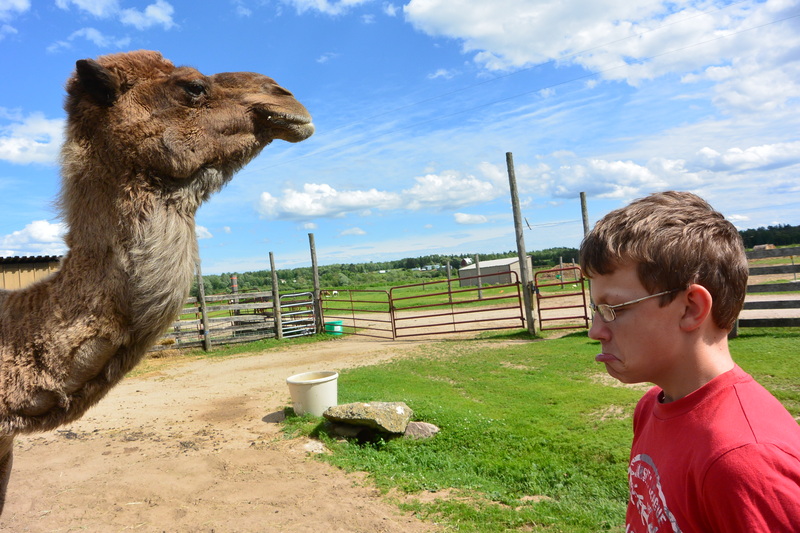 All I could do while visiting the other animals was mutter, “A %^(@*$ camel. 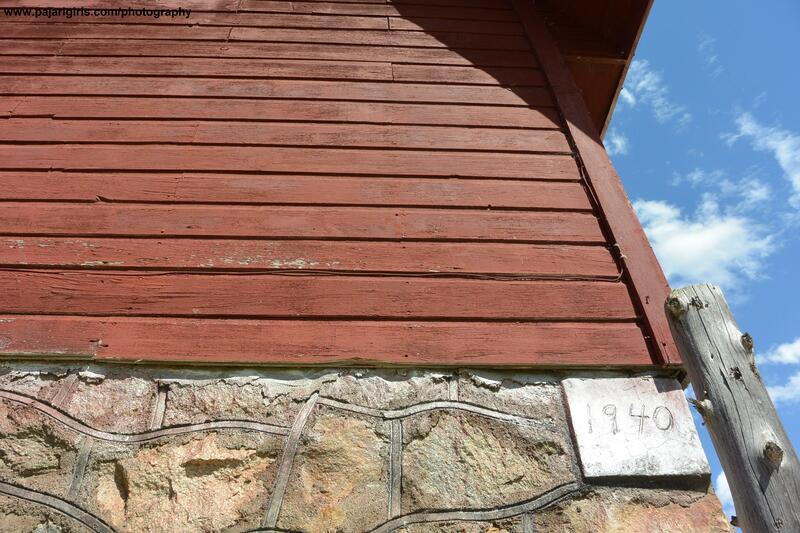 In northern MN…” Even today, I am having trouble describing this experience. 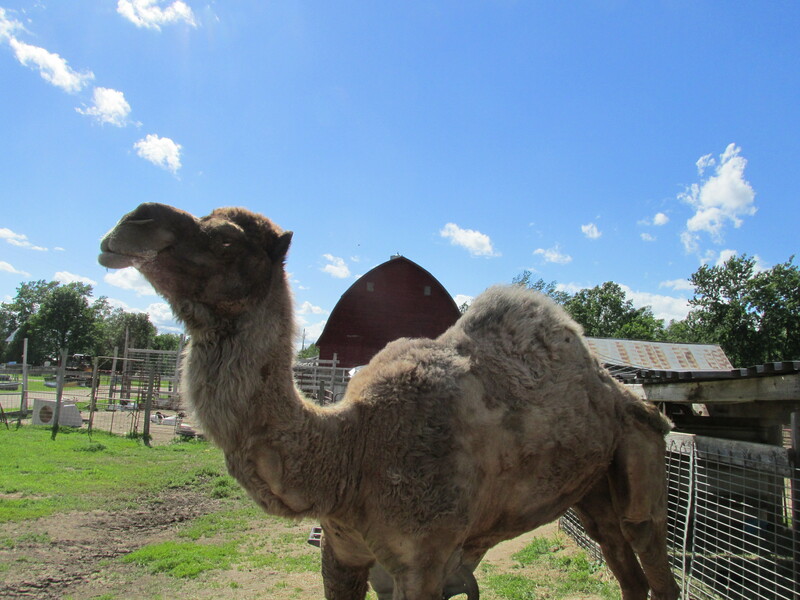 Which is why it’s taken so long to get this post done, and why we keep having to explain that, no, we don’t have our own camel… Yet. 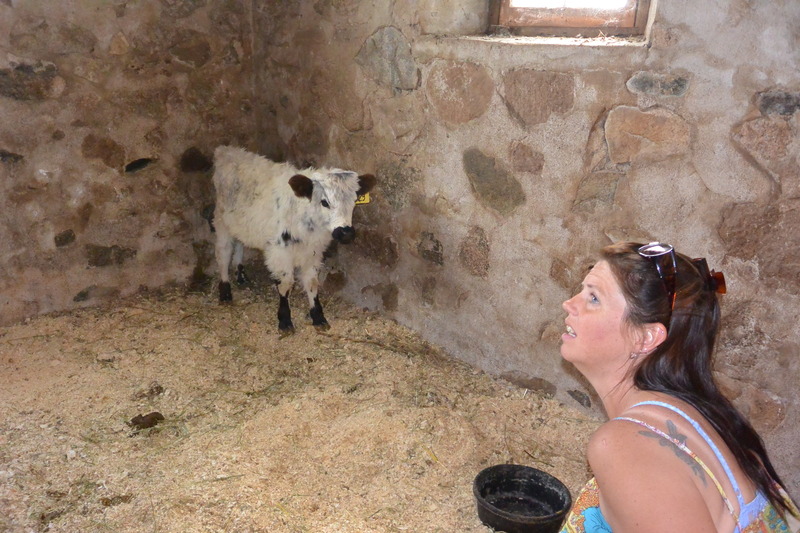 This is my sister explaining to Wally why this bull calf is NOT going home with us today. You can kind of get a sense of scale by the chicken that almost comes up to his knee. 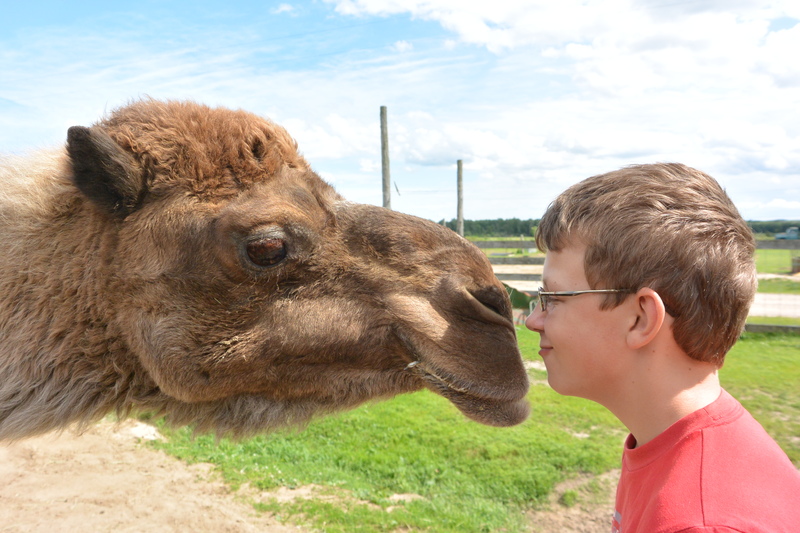 It looks like Thomas is kissing Wally, but that is how animals in the CAMELID family say hi. 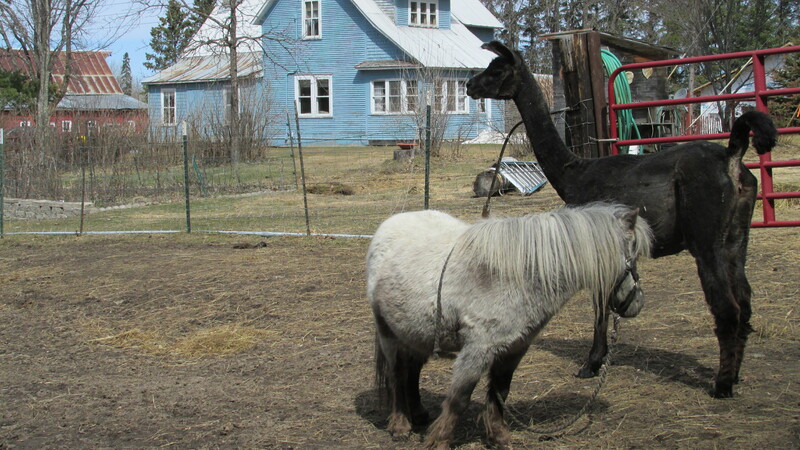 (Llamas and alpacas are in the same family, btw.) It’s sort of like dogs smelling each others’ butts, but nicer and much more sanitary. Camelids say hello by smelling your exhales through your nose. It can be intimidating to have these creatures stick their face in yours immediately upon meeting- especially when they are infamous for spitting- but do it anyway. 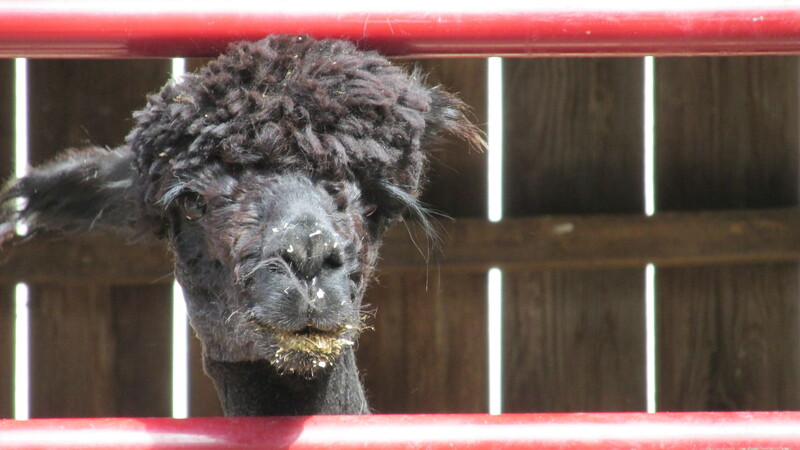 In my experience, llamas and alpacas only “spit” -it’s really closer to projectile vomit-when they are frightened. And they give plenty of warning signs before they spew, but that’s another post. This is my youngest Spawn, Danny. He and Thomas seemed to really “get” each other. Now if I could talk Mr. 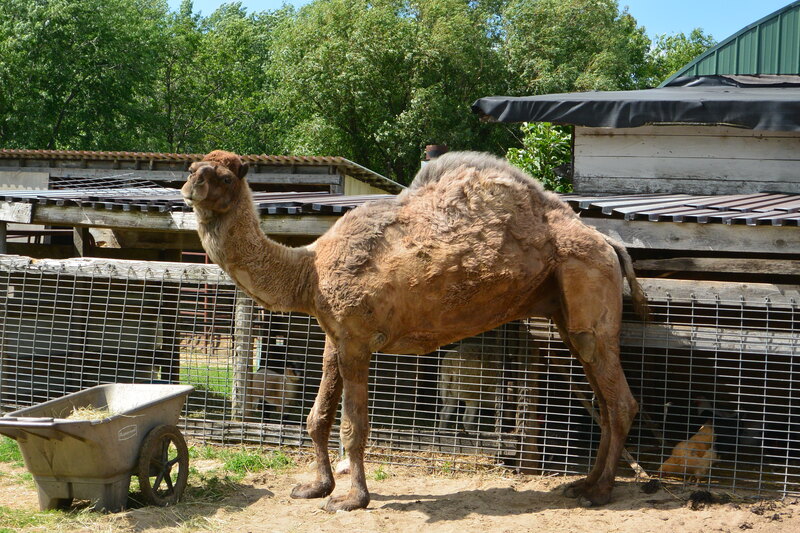 Wonderful into letting us put a camel in our basement…just for the winter. A Pajari Girl can dream, right?? It’s tall enough, it’s warm enough, and it has a sand floor. AND THERE WOULD BE A CAMEL IN MY BASEMENT!!!!! Omigod it would be GREAT. He doesn’t even smell bad. I checked. Kind of dusty, but that’s about it. And my sister knows a lot more than she thinks she does about Camelids. And Dr. Rathji (sp?) already comes to see the llamas and alpacas. 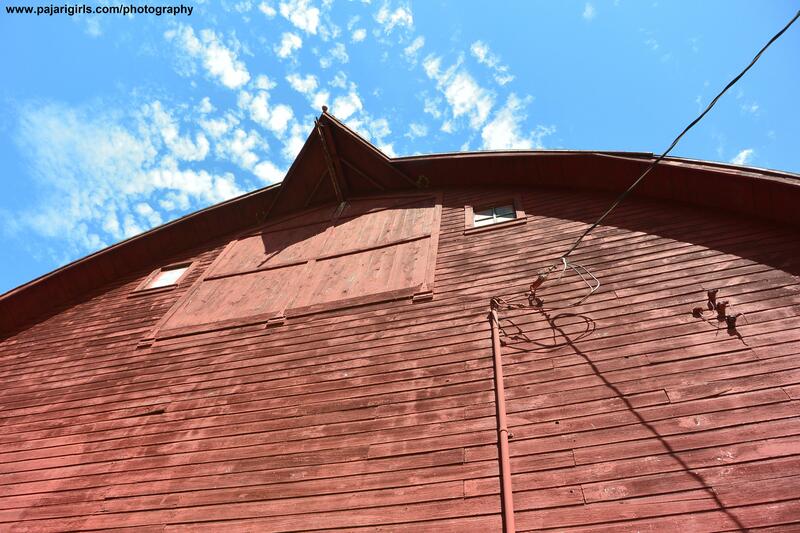 While I was busy figuring out how to talk Paul into it, Danny followed Wally and Lois into another barn. “That’s nice..what the hell? 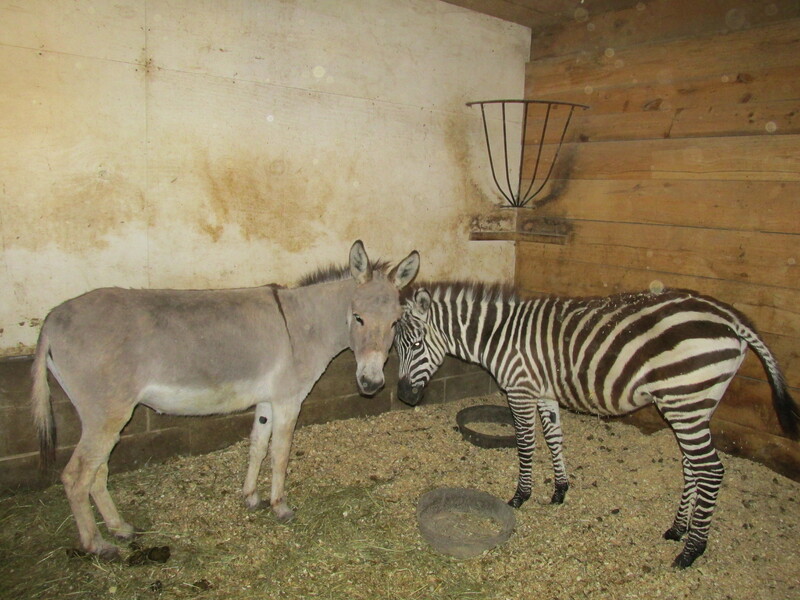 ?” Sure enough, a zebra and a donkey were sharing a pen in the hopes of producing a zonkey. And around the corner from THAT? 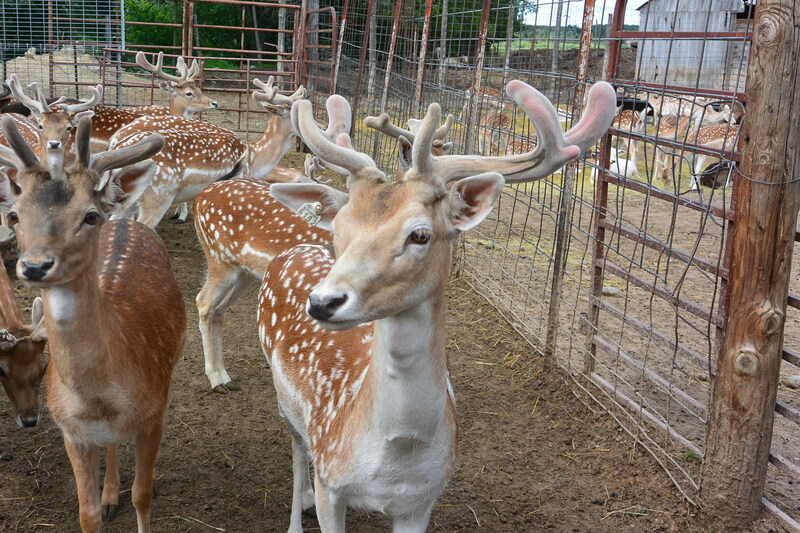 Fallow deer. Today was Shearing Day at Cook’s Country Connection! Marty Hofmann of Integrity Shearing and his “Head Man” Eric were incredibly efficient and gentle with all the creatures getting haircuts. First, let me start with this; a picture of a shaved alpaca. And below is Molly, my faithful camera assistant. She made sure to drool on my camera strap and nuzzle my pockets for goodies. 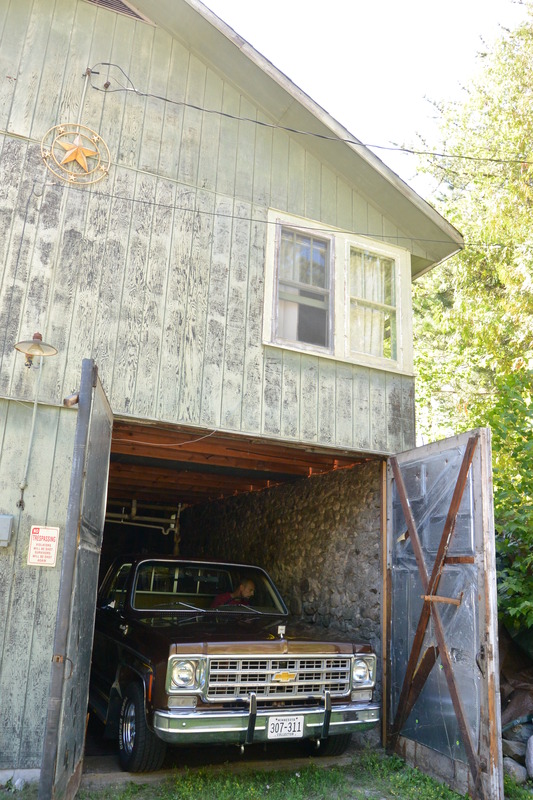 400 pounds of helpful, this one. Softer than cashmere and warmer than wool, alpaca fiber can be knit or woven, depending on it’s quality and intended purpose. 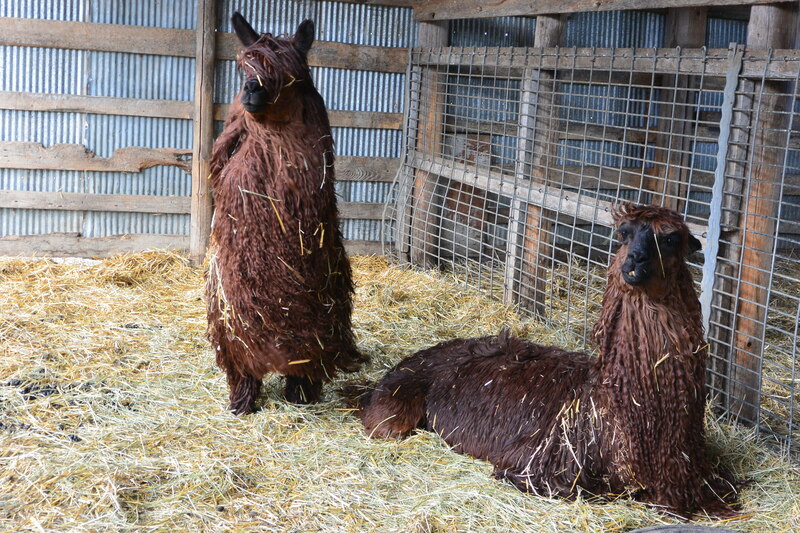 Here is a wiki link to everything ELSE you ever wanted to know about Alpaca Fiber. Next year, we hope to have a seminar or field trip coincide with Shearing Day. The front legs are pulled forward, the back legs backward, and just like that, it’s time to shave a llama. Steve’s dad Leo did a great job his first time as official Gate Man. 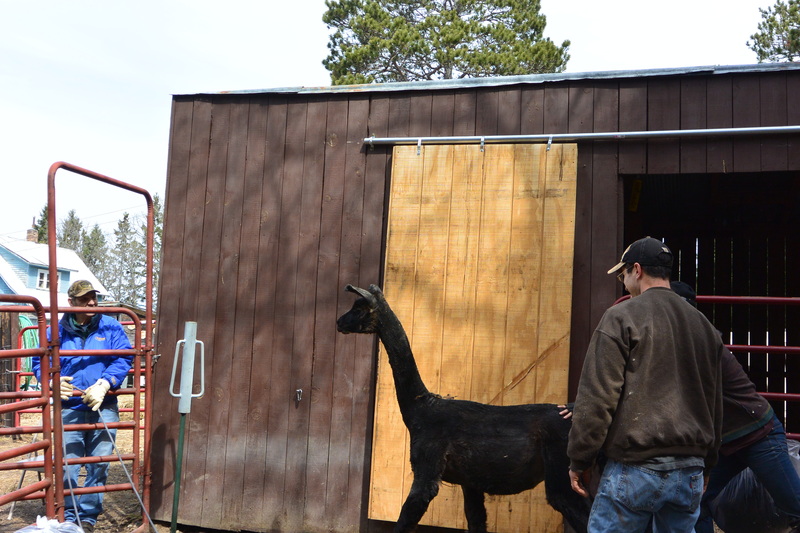 Jill was the only llama not to get the royal treatment today; she has a heart defect and is a Gramma Llama, so Lois didn’t want to stress her out. 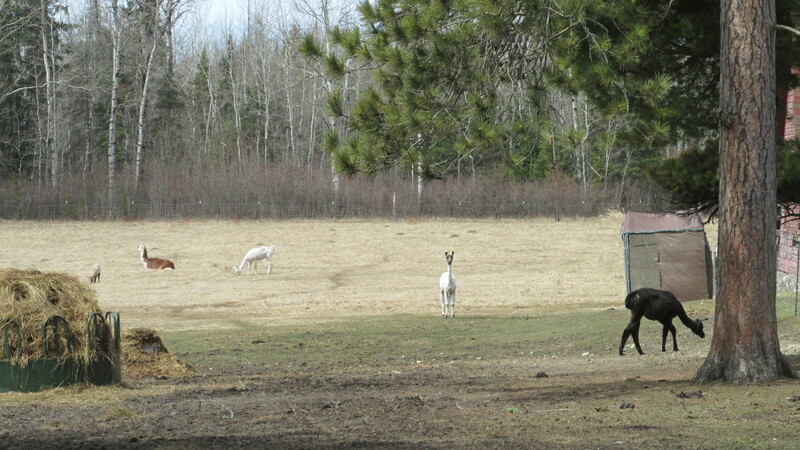 She didn’t recognize her herd-mates until they breathed at each other a bit. Itchy (The Very Naughty Pony) was equally confused. 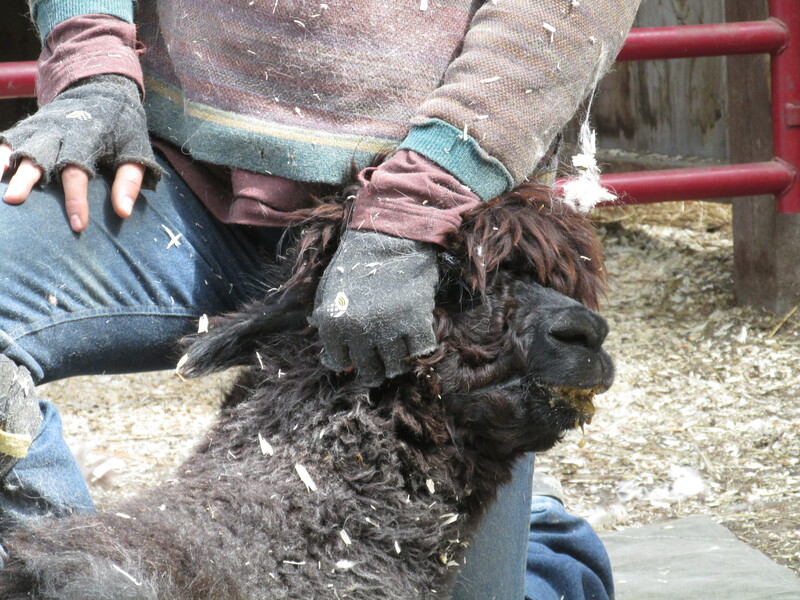 And THIS is as close as anyone will be getting to a llama for a few days, which is why we take this opportunity to vaccinate, de- worm and do pedicures at the same time. 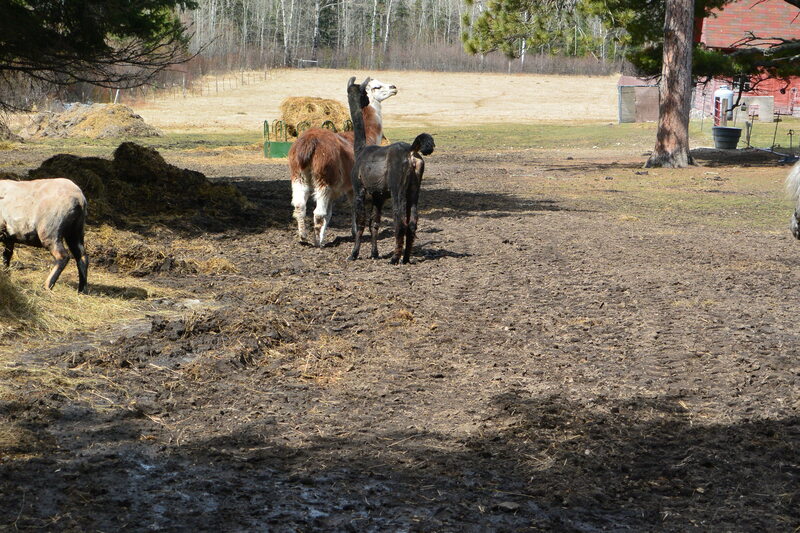 Madelyn, Fancy, Annie and W-72 are the farm’s Huacaya alpacas. 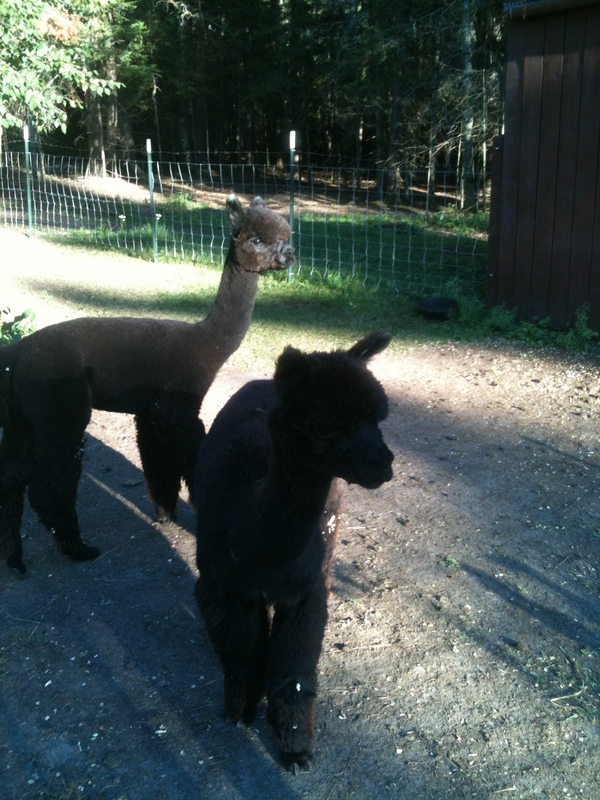 Alpacas are in the camel family and bred for their fiber (and meat but we don’t think about that!). The fiber from an alpaca is warmer than wool and softer than cashmere. It makes a person really want to hug and smooch them. Unfortunately alpacas aren’t much into being hugged and smooched. 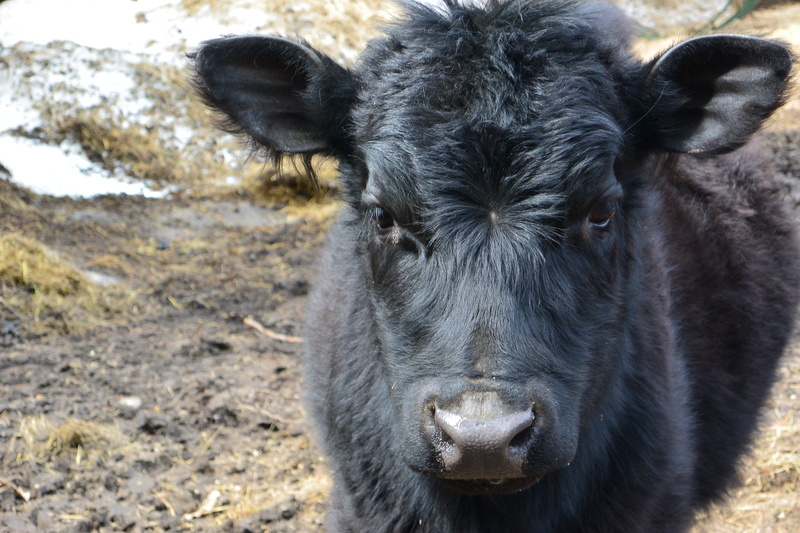 What they look like depends on when you visit the farm. 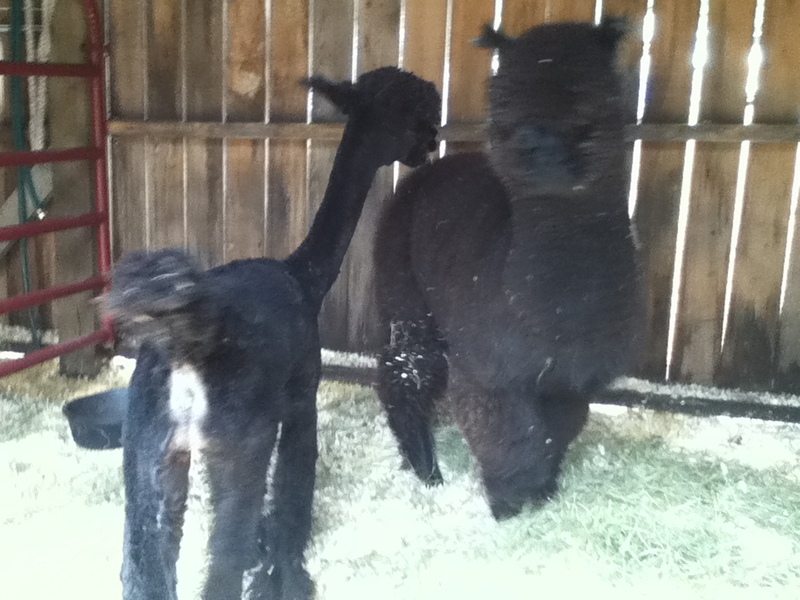 This picture shows Madelyn after shearing and Maddox before! Fuzzy wuzzy wasn’t fuzzy wuzzy!